Conservatories vs Orangeries: What’s best for your home? When looking to extend your home, there are so many options but it can be confusing to decide what’s best for your home. Increasing your living space with a light-filled extension is one of the most popular home improvements as it can add so much to your home. As well as giving you more space to enjoy, an orangery or conservatory can increase the value of your home as well as transform how it looks. A conservatory is an extension with the majority of the structure being made up of glazing. This makes them perfect for bringing you closer to your garden and enjoying outside views whatever the weather. An orangery has brick pillars which makes it look more like a natural part of your home. They make an impressive extension to your home and can be matched to look like the rest of your home. Both a conservatory and orangery can be used for anything from an elegant dining room to a children’s play room. You may feel like everyone has a conservatory now; an orangery can make your home stand out from the rest. 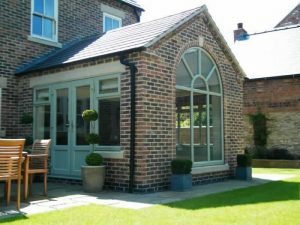 However, with a range of conservatory styles from the traditional Victorian to the modern Loggia, your home can create its own look. With a bespoke conservatory, you can pick a unique design that perfectly suits your home. Available in a wide variety of colours including wood effect finishes, you can truly create an impressive extension of your home. An orangery can give you more privacy if your garden is overlooked and provides shade from the sun. The beautiful glazed roof also gives you a vaulted perimeter ceiling which allows you to have spotlights and speakers fitted in. With a conservatory, you can choose an efficient glass or a warm tiled roof. You can control how much or how little glazing you have. A tiled roof gives you improved insulation but with skylights installed you can still fill your room with light. When it comes to thermal efficiency, both conservatories and orangeries excel. With high quality uPVC or aluminium frames, heat is kept inside to give you a room you’ll be comfortable in all year round. The brick pillars in an orangery offer high levels of energy efficiency similar to that of your existing house. With a conservatory, solar control high quality glass lets light flood in without overheating your room. Conservatories vs orangeries: Which is better for your home? Whether you choose a conservatory or orangery, both have the potential to transform your home. Offering you more space for your family to enjoy, your home will be the envy of your street. Both can be made to fit your home’s exact style or give it a modern twist. 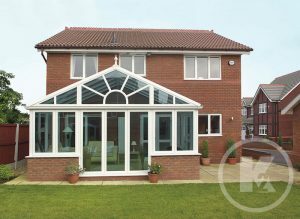 K Glazing can help find your perfect home extension that will change how you use and enjoy your home. Get in touch today to find the right one for you. This entry was posted in Conservatories, Orangeries.